In this post we will Using Diagnostics in ASP.NET MVC 6 (Core 1.0), we will see how to easily sort out coding issue in a sample application. The ASP.NET Core 1.0 release (currently in RC1) provides several new features as well as improvements to existing features. One such very useful feature is Diagnostics. ASP.NET Core a.k.a ASP.NET 5 simplifies diagnostics. In this article, we will go through the Diagnostics feature and see how to implement it in an ASP.NET MVC 6 application. This application is implemented using Visual Studio 2015 and ASP.NET Core 1.0. Step 1: Open Visual Studio 2015 and create a new ASP.NET Web Application from Add New Project Click on OK and select Empty from ASP.NET 5 Templates. Click on OK to create the project. This will add the necessary references in the project. The above code contains the entity class of name Employee and the EmployeesDatabase class contains some Employee records in it. The DataAccess class contains Get() method and returns EmployeesDatabase class instance. The above code contains an interface of name IService<T> where T is the type. The EmployeeService implements IService interface. The constructor of EmployeeService is injected with the DataAccess object. Step 5: In the same project, add a Controllers folder and in this folder add a MVC Controller Class using Add > New Item > MVC Controller class. By default, the name of the controller class is HomeController, rename it to EmployeeController. This will be used to execute new asp- attribute in MVC Views. The above code uses an if statement to check the EnvironmentName, this is used to verify the current mode in which the application is running. Currently we are using development mode. 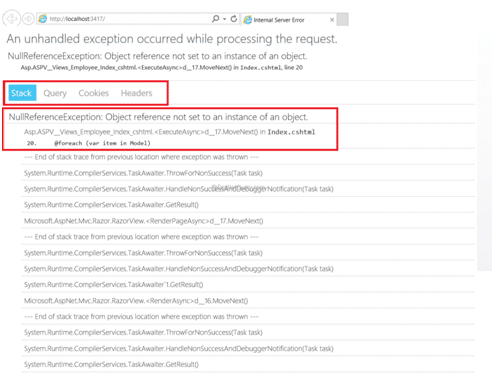 The UseDeveloperException() extension method is used to render the exception during the development mode. We are injecting the IService<Employee> in the EmployeeController constructor. The Index() action method is calling the Get() method of the IService. 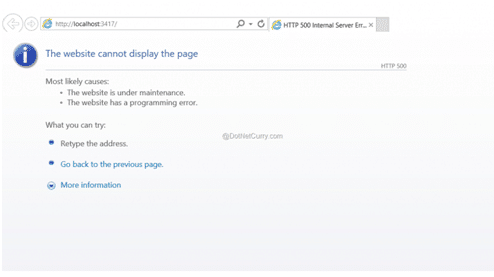 The above error shows the Unable to resolve the DataAccess error. To resolve this, let’s verify the code of EmployeeService class. In the constructor, we are passing the dependency of DataAccess but we have not registered it in the ConfgureServices() method. Add the following code in the ConfgureServices() method. We have added the DataAccess as a dependency in the application.